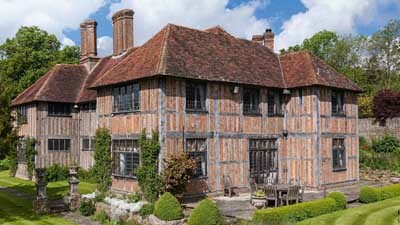 It’s hard to imagine a setting more idyllic than that of historic, Grade II-listed Socknersh Manor -currently for sale through Knight Frank (020-7629 8171) at a guide price of ‘excess £5 million’-which sits high on a quiet hillside between Brightling and Burwash in the heart of the Sussex Weald, overlooking a peaceful wooded valley a few miles inland from the coastal towns of Hastings and Pevensey. This part of Sussex is renowned for its grand houses and large estates, many of them, including Socknersh, created after the Conquest, when the Normans took over the lands of the defeated Saxons. The story of Socknersh Manor begins with Robert de St Leger, who is said to have held out his arm to support William the Conqueror as he stepped off his ship at Pevensey Bay in 1066. The St Leger family, who owned Robertsbridge Abbey in Kent, became the fourth biggest landowners after the King, and Robert’s grandson, Rogo, was given the Socknersh estate, and adopted the name of de Socknersh. All was well until 1215, when the de Socknersh family aligned themselves with the rebel barons against King John. The then Rogo de Socknersh was offered a pardon by the new king, Henry III, but he refused, and was hung, drawn and quartered in the Tower of London. Socknersh was held by the St Legers and their heirs until the 14th century, after which it passed to another ancient Sussex family, the de Boxhulls. An article on Socknersh Manor in Country Life (November 26, 1904) highlights the tranquillity of its location ‘quiet as it is in this sequestered backwater of the stream of Sussex existence’ and the beauty of the surrounding countryside, ‘abounding in well-timbered and precipitous hills and dales, among the fairest in this fair county’. More than 100 years on, little has changed here, and, as the writer suggests, ‘it is hard to imagine that busy human life once peopled these sleepy hollows, huge furnaces flared to heaven, hammers clanged, and the iron-workers passed briskly to and fro about their business. Great guns were forged in these places, and the cannon that roared out at the Armada, and bombarded La Rochelle, and resounded at Edgehill, were cast in these parts of Sussex’. In medieval times, the Weald was covered with forests, much of which was cut to feed the furnaces of the ironworks that were the source of the area’s wealth from the 13th to the 18th century. The furnace at Socknersh, which operated between about 1525 and 1675, was probably built by John Ashburnham, who also owned a furnace in Ashburnham and a forge in Penshurst. John Collins, the first of the Collins dynasty of Socknersh ironmasters, bought the Socknersh furnace from Ashburnham, and the family moved to Manor Farm, where, in the early 1600s, the present manor house was built, presumably by the wealthy Capt Thomas Collins JP, a rigid Presbyterian and a loyal Parliamentarian, who inherited Socknersh on his father’s death in 1612. He was later one of about 20 sequestrators for Sussex appointed by Cromwell to seize the estates of Royalists who had fought on the wrong side during the Civil War. The last of the Collins family to live at Socknersh was Henry Collins, who died childless in 1753, leaving the estate to his cousin George. Thereafter, the property was sold several times and, according to an article in The Sussex County Magazine in 1934, ‘Socknersh-like other old houses- passed through an epoch of sad neglect when it was used as a farmhouse’, before being rescued by Mrs Odo Cross, who had bought it in a state of disrepair some years before. Then, as now, the house, set at the end of its long tree-lined drive, surprised the visitor ‘with its mottled many-patterned walls of red brick… mostly laid herringbone fashion bet- ween the silver-toned beamwork’. Acting as her own architect, Mrs Cross made a number of skilful alterations to the manor, taking great care to retrieve and restore as many original elements as possible. 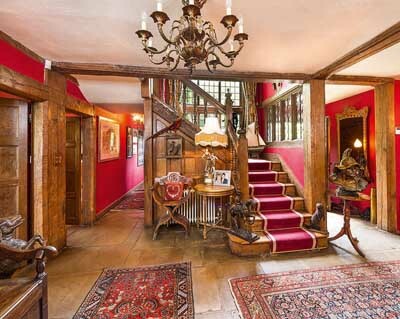 The south entrance of the house leads into a very large room, only half of which is old. The rest, including a bay window on the south side, was added by Mrs Cross. She also added a servants’ wing to the oldest part of the house, which had probably been damaged by fire. Russell Beswick, the present owner of Socknersh, was born within 3. miles of the manor as the crow flies, yet never knew it existed until he drove down that long, tree-lined drive to view it, when it last came on the market 10 years ago. 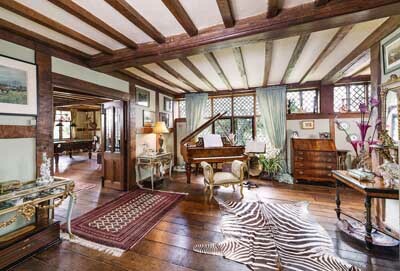 The previous owner had been there for 20 years and had done much heavy-duty work about the house, but there was still ‘a fair bit to do’, Mr Beswick admits. Yet, in no time at all, he and his wife had overhauled the interior of the house, preserving its wonderful historic features at the same time as installing modern essentials such as a new Mark Wilkinson kitchen and several state-of-the-art bathrooms. Today’s manageable manor house has four main reception rooms, a first-floor sitting room, a kitchen/breakfast room, a sumptuous master suite, five further bedrooms and four bathrooms. Having restored Socknersh’s gardens to their former splendour, Mr Beswick, a self-confessed sports fanatic, set about creating his ‘Socknersh world of adventure’ in the property’s 56 acres of grounds, the focal point of which was the five-acre freshwater lake below the house, then badly silted-up and choked with weeds. The lake was dredged and stocked with fish, an unsightly island and footbridge were replaced by a traditional oak-framed boathouse, and the Beswick family’s private watersports centre was born. A stable block with seven loose boxes was added in 2010, along with a crosscountry course, and two banks of woodland-Park Wood and Furnace Wood-formed the basis of a small family shoot. A floodlit hard tennis court and a swimming pool with glorious views of the valley complete the sporting picture. Farewell iron-masters, this is the age of the Iron Man.